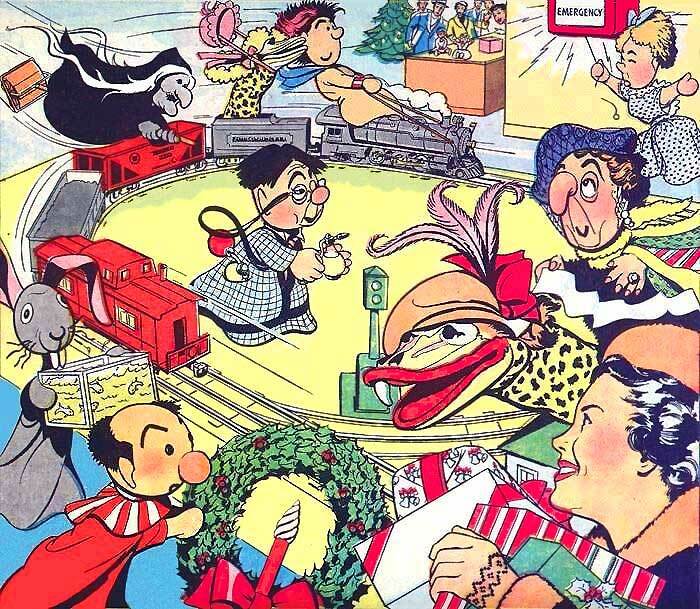 In December of 1950, the troupe appeared in a series of six Christmas comics in the Chicago Sun-Times. Beautifully drawn by an artist identified only in the final comic as "Carlucci," they each include a typically Kuklapolitan story about preparing for the holidays. VERY year, the Kuklapolitans, like many of us, put off Christmas shopping until the last minute but this year Kukla and Fran decided that there would be no mad rush. So the whole troupe got into the station wagon and drove down to Glockenspiel's Department Store. Ollie thought that someone should stay home with his cousin Doloras but everyone wanted to go shopping so they brought her along and Mercedes and Cecil Bill said they would take care of her. When the doors opened the Kuklapolitans scattered in all directions, each with his secret shopping list. Everything went smoothly until it came time to go home. Madame Ooglepuss was selecting the kind of tie she thought Colonel Crackie should wear. Colonel Crackie was in the perfume section looking for Magnolia Blossom perfume. Buelah Witch and Fletcher Rabbit had started out with good intentions but hadn’t made much headway. Buelah was in the household department to check a new line of brooms and Fletcher was involved in a long discussion on the care and feeding of guppies in the Pet Dept. Doloras was safe in the Toy Department with Cecil Bill and Mercedes – or so Fran thought. Then suddenly it happened!! With a great clang the emergency alarm bell went off. Each of the Kuklapolitans immediately thought of little Doloras. Buelah jumped on what she thought was the nearest broom. It turned out to be a carpet sweeper and she did a couple of barrel rolls before she got off. In a flash she had covered all departments – screaming at the top of her lungs. Fletcher, quick thinking as usual, grabbed a tank of guppies and ran up the down escalator. From every part of the store the Kuklapolitans rushed to the toy department. There was Mercedes pulling the alarm bell with all her might. Ollie was the last to arrive. Without thinking, he had clapped on the hat he was going to buy Fran. "What's happened? Wheres my little cousin?" he cried. "Somebody save her!!" But Doloras didn't seem very worried. As a matter of fact she was having a wonderful time, riding in the coal car of a fast toy freight train. A very worried Cecil Bill was in the engine, working feverishly with the throttle. "After all, the alarm was for Emergency Use." And everyone agreed a runaway train was an emergency. What a day!! As they drove home, Kukla said, "You know, Fran. I don't think it makes much difference whether we do our shopping early or late. Whenever the Kuklapolitans do anything – there’s bound to be excitement."